Auspicious stars overshadow inauspicious stars this year, and you will be expecting love and addition of new life to your family. This is a lucky year for those born in the year of Monkey. No matter what you do, you will be full of vigor and vitality. No matter at home or abroad, you will be assisted by powerful figures, and all problems will be resolved. There is a chance for promotion or increment. Any troubles or difficulties from the previous year will be resolved. But whether you remain in an old position or change to a new environment, you must be modest. This is also a good year to change a job. There is a high chance in windfalls and striking lottery. If the number comes to you, you may want to place a higher bet, but you must not over-indulge. It is a good time to invest in long-term stocks, but you should still practice caution, as investment can be risky. This is an ideal year for marriage. Single men and women might fall in love and start an enviable relationship. This is also the year to make a decision for unhappy relationship. Family life is harmonious with steady finance. Children excel in the academics, and may travel abroad for studies. Pay more attention to personal diet and health, especially for those born in 1944. Married men and women born in 1968 should beware of peach blossom (桃花), which might affect the family’s fortune. 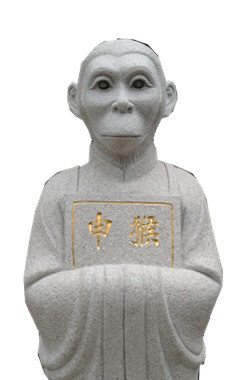 Anyone born in the year of Monkey should pray to Taisui, light a lamp for blessing, and engage in more charitable deeds. Do bring home an auspicious ornament for good fortune.